The United States government has granted over one million (currently active) Top Secret Clearances. [i] The TSC community encompasses the entire National Clandestine Community, DCS/CIA/NSA/ISA/JSOC—all alphabet agencies. As most TSC holders know, “support” CONTRACTORS, like Booze-A-Hamilton, bucket handsome sums of US-taxpayer pelf to vet and hire many of the job applicants for which a TSC is required, including many of our National Clandestine Servants. Contractors, like CGI and SAIC, spend tens of thousands, sometimes hundreds of thousands, of dollars vetting these applicants, testing their IQs, assessing physical and psychological fitness, probing subject expertise. These “contracted support” corporations also cull biometric data from each applicant, including, of course, DNA samples. By the time they’re done vetting you, they know pretty much every detail of your life (exercise habits, drinking habits, marital habits, reading habits) from the genetic level up. And they store your “life info” in their own privately owned data banks. Many of these head-hunting contractors have already assembled their own company data banks out of the information they have gathered from TSC applicants, even from applicants they choose not to hire. Typically, TSC contractors, like CGI, are multinational corporations whose primary loyalty is to the bottom line. Anybody can go online and scan the job openings at these companies and then infer what the US clandestine services need by way of expertise and where. For example, you can find detailed information in these “job openings” announcements for Farsi or Urdu interpreters, including the specific geo-physical environment in which the future TSC holder will be operating, how long they’ll be deployed and so forth—information that should be CLASSIFIED and snugly protected by a firewall. Prime Minister Narendra Modi landed in Lahore on Christmas Day — which is also the birthday of the founder of the state, Muhammad Ali Jinnah, and therefore a public holiday — and congratulated Pakistan PM Nawaz Sharif on the wedding of his granddaughter. We will leave aside the matter of who invited whom and who thought of the visit first lest we catch flak from the two national media fighting their shadow war in the backdrop. Modi was friendly, hands locked reverentially and all smiles, as if the two PMs had decided to change tack and look willing to normalise India-Pakistan relations. Sharif was at his hospitable best. His younger brother, Shahbaz Sharif, spread the red carpet at the Lahore airport, where a hundred-strong Indian delegation was to wait out the goodwill visit to Jati Umra, the Sharif family’s residence named after their pre-1947 village near Amritsar. Clearly, the two leaders wished to break new ground. But at Lahore, they were not going to pronounce on their fearfully clotted foreign policies laboriously woven by their bureaucracies to prevent solutions. The signal was clear and it was good. 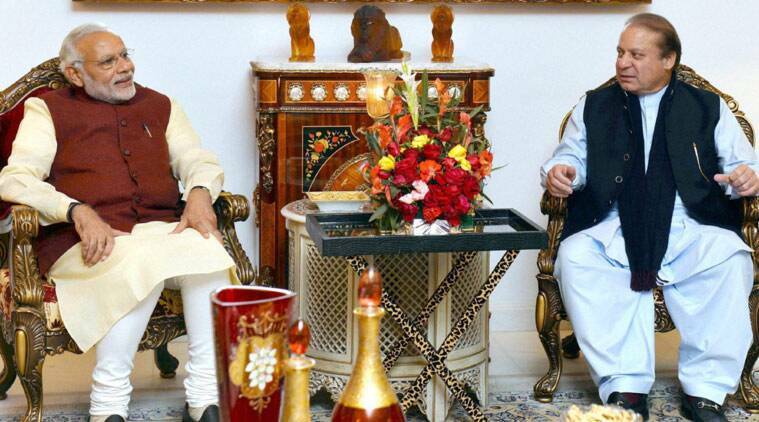 When Modi met Sharif’s mother, the optics were just right. She said, “We have to live together.” Jinnah had also said that about the two neighbouring states before his death. The leaders correctly recalled the 1999 visit of PM Atal Bihari Vajpayee and signalled their resolve to keep to that track despite bad precedents. In the political and economic theatre of India, it is normally one step forward and several steps backwards. While we keep moaning about improving the ease of doing business and ensuring that India takes baby steps towards becoming a manufacturing hub through the Make In India programme, our bureaucracy refuses to unshackle itself from the licence raj mindset which was replete with a draconian inspector raj regime. As we know nothing has really changed and foreign investment continues to find impediments and imponderables strewn in its path as it ventures into India. Making them irascible and crabby, the fear of the unknown stalking them at all times. Beginning with the inability to repeal the swingeing land acquisition bill, the very tentpoles required for a Make In India scenario are not available in India. In the continuing litany of woes, here is another very recent example which is symptomatic of the prevailing situation in India where the bureaucracy and inspector raj is so deeply entrenched in the system that it is impossible to evict them. On December 1, Assistant Commissioner - special investigation and intelligence branch in the Office of Commissioner Customs - Imports and General, New Custom House, near IGI Airport sent an innocuous but very curious and dangerous missive to the Deputy Commissioner - Import Shed All Cargo Complex - Import, New Delhi on the import of mobile parts and mobile phones in CKD (completely knocked down) and SKD (semi knocked down) condition by the manufacturers of mobile phones without payment of duty. The terse order went onto say: It is requested that no consignment of mobile parts in CKD/SKD condition imported without payment of duty by mobile phone manufacturers be allowed clearance without a NOC (no objection certificate) from ACC - SIIB. This issues with the approval of Joint Commissioner SIIB - Import. 'The military oligarchy in Pakistan has a totally different view of what is desirable and possible in the subcontinent,' says Lieutenant General Ashok Joshi (retd). It is an understatement to say that Prime Minister Narendra Modi's visit to Pakistan on Christmas came merely as a pleasant surprise. It generated a happy feeling in the subcontinent, and except for the sworn 'Opposition', the bonhomie was shared alike by the common man and the elite. The prime minister's bold initiative was greatly admired in many parts of the world. He had also emphasised that cooperation and support of its neighbours, including that of Pakistan, was necessary. Ordinarily, this would have set the cat among the pigeons in Pakistan because the Indian presence in Afghanistan is anathema to the military leadership in that country. The military in Pakistan looks upon Afghanistan as its backyard, to be used the way it likes. In its eyes Afghanistan confers 'strategic depth' on Pakistan. The Indian presence in Afghanistan revolts against the Pakistan military's fundamental assumptions. Prime Minister Modi's visit to Afghanistan, in the normal course, would have ended with acerbic comments in the Pakistani media. Not like Nixon to China For now, the best outcome of the ‘Modi to Lahore’ foray comprises only modest possibilities. For some it was a “Nixon to China” moment. There were similarities also with Anwar Sadat’s trip to Jerusalem that marked the beginning of the Arab-Israeli peace process. 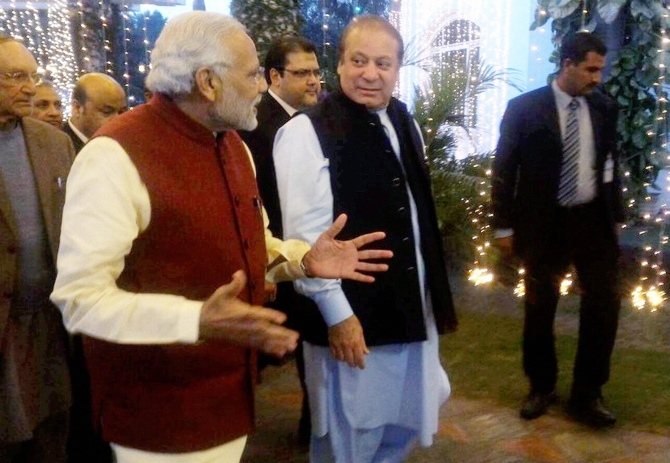 Pakistan Prime Minister Nawaz Sharif boldly invited his Indian counterpart, Narendra Modi, to drop in and Modi stopped over in Lahore on Christmas Day on the way back to Delhi from Kabul. As gestures go, it was as clear a statement as any by both leaders that they are committed to overcoming the burden of the past and building a better future for India-Pakistan relations.But while dramatic gestures are an integral part of international relations and diplomacy, good ties between nations with an adversarial past are not made of dramatic gestures alone. Richard Nixon’s China trip was preceded by and followed up with several rounds of meticulous negotiations. The US realised it could not ignore a nation of one billion people forever. American corporations salivated at the prospect of access to a new market comprising almost a fifth of the world’s population. On the Chinese side, Mao and Zhou Enlai persuaded their colleagues that China needed peace with the US to deal with threats from the Soviet Union. Later, Deng Xiaoping’s “Four Modernisations” concept transformed the Chinese Communist Party. Deng argued successfully that China needed to modernise, catch up with the world before thinking of itself as a global power. The US-China entente paved the way for China’s peaceful rise and, some would argue, the demise of the Soviet Union. But it also left the Communist Party entrenched in power, albeit at the head of a capitalist economy. Both China and the US benefited, though China may have profited more. Nixon went to China in 1972, paving the way for 43 years of cooperation between two countries that had been adversaries until then. Although the US stopped recognising the Republic of China government in Taiwan, it did not abandon Taiwan’s security. China went on to build its own economic ties with Taiwan under the “One Country, Two Systems” slogan. Anwar Sadat’s trip to Jerusalem did not result in a similarly enduring peace. He secured the return of the Sinai Peninsula from Israel and became the first Arab leader to establish diplomatic relations with the Jewish state. Egypt and Israel are still at peace but the hoped-for broader Arab-Israeli normalisation has not materialised. Both Sadat and his Israeli partner in the peace talks, Yitzhak Rabin, were assassinated by extremists. All Arabs have not accepted the right of Israel to exist, a Palestinian state has not emerged, neither Israeli occupation nor terror have ended. The recent announcement that India and Pakistan would resume substantive engagement came as a welcome surprise, especially because it was not accompanied by the baggage of fanfare, which has become the hallmark of the ritualistic "talk about talks". The announcement was done quietly and outside the glare of both the media and the public. The two Foreign Secretaries will meet in January to chalk out a calendar of meetings. Both Prime Ministers are aware that if the talks break down, the damage, in public perception, would be minimal, as India-Pakistan talks are known to regularly fail. In such an eventuality, the official spokespersons are likely to take recourse to the usual blame game. The substantive talks need to be done behind closed doors and outside the media glare. At the same time, both Prime Ministers are also acutely aware that should the negotiations conclude successfully, they would be guaranteed a place in history. In the eyes of the international community and in their respective domestic constituencies, it would be seen as an extraordinary achievement that could transform the region. For the beleaguered PM Sharif, this would be a feather in his cap at a deeply troubling time in Pakistan. For PM Modi, this would reflect statesmanship of exceptional calibre. Both, consequently, face a win-win situation. A unique opportunity exists to approach the talks with an open mind. For a successful outcome this time around, negotiating strategies need to be reimagined. Negotiations assume a conflict. How negotiations are approached determines the positions we take. If we approach negotiations in bad faith, the negotiations will fail even before they are begun. On the other hand, if talks are entered into in good faith, irrespective of the pressures that might have brought the negotiators to the table, the negotiation would assume an entirely different complexion. The substantive talks need to be done behind closed doors and outside the media glare. There are many, on both sides of the border, who oppose normalising bilateral relations. They have fixed mindsets, and will aim to disrupt the talks and vitiate the atmosphere. This is the time for quiet diplomacy. Chinese media reports suggest the J-20 is ready for production, ahead of schedule. Previous versions of the J-20 have been numbered in the 2000s (with the first prototype labeled 2001 and the most recent 2017). The appearance of a number in the 2100s hints to China’s online military enthuasists that production has entered the production stage – although Xinhua cautions that the initial production run for the J-20 may be limited at first. In particular, unnamed experts cautioned that the software used in fifth-generation fighters will need additional testing, even if the body of the aircraft is finalized. Experts interviewed by Xinhua said the J-20 would have progressed to production quite quickly if the rumors are true. The first J-20 took flight in 2011, less than five years ago. Xinhua notes there were no major changes from the previous images of the 2017 version to this new 2101 J-20, meaning the design is already fairly set, with only minor alterations expected from here on out. Critics believe the design has progressed so quickly because China based its J-20 on stolen plans for the United States’ F-22 and F-35. The J-20 is China’s first attempt at a stealth fighter, and details are scarce. Observers are not even certain which engine the planes will use, whether China’s indigenously-created WS-15 or a Russian import, such as the AL-31 used in earlier J-20 prototypes (China may also be interested in reverse-engineering the new AL-117S engine used in 24 Su-35s Beijing just purchased from Russia). The severity of China’s economic problems—and the inability to implement long-term solutions—mean almost all geopolitical assumptions about tomorrow are wrong. Virtually everyone today sees China as a major power in the future. Yet the country’s extraordinary economic difficulties will result in a collapse or a long-term decline, and either outcome suggests China will return to the ranks of weak states. As an initial matter, China’s current situation is far worse than the official National Bureau of Statistics reports. The NBS maintains that the country’s gross domestic product rose 6.9 percent during the third calendar quarter of this year after increases of 7.0 percent during each of the first two quarters. Willem Buiter, Citigroup’s chief economist, a few months ago suggested the rate was closer to 4 percent, and growth could be as low as the 2.2 percent that people in Beijing were privately talking about mid-year. The most reliable indicator of Chinese economic activity remains the consumption of electricity, and for the first eleven months of the year electricity consumption increased by only 0.7 percent according to China’s National Energy Administration. Other statistics confirm extremely slow growth. For instance, imports, a sign of both manufacturing and consumption trends, fell 8.7 percent in November in dollar terms, marking a record thirteen straight months of decline. Exports were down 6.8 percent, the fifth straight month in the red. WASHINGTON — Even as the Obama administration scrambles to confront the Islamic State and resurgent Taliban, an old enemy seems to be reappearing in Afghanistan: Qaeda training camps are sprouting up there, forcing the Pentagon and American intelligence agencies to assess whether they could again become a breeding ground for attacks on the United States. Most of the handful of camps are not as big as those that Osama bin Laden built before the Sept. 11, 2001, attacks. But had they re-emerged several years ago, they would have rocketed to the top of potential threats presented to President Obama in his daily intelligence briefing. Now, they are just one of many — and perhaps, American officials say, not even the most urgent on the Pentagon’s list in Afghanistan. At least in public, the administration has said little about the new challenge or its strategy for confronting the threat from Al Qaeda, even as it rushes to help the Afghan government confront what has been viewed as the more imminent threat, the surge in violent attacks from the Taliban, the Haqqani network and a new offshoot of the Islamic State. Former administration officials have been more outspoken — especially those who were on the front lines of the original battle to destroy Al Qaeda’s central leadership. NEW YORK – The filmmaker Woody Allen is often quoted as saying that “Showing up is 80% of life.” One can quibble with the percentage, but Allen’s insight is important: You have to get in the game – be a player – to have any chance of obtaining your objectives. The same is true of world affairs. If showing up is 80% of life, at least 80% of foreign policy is following up. Smart plans, good intentions, and strong negotiating skills are essential, but they are never enough – not even close. As with business, education, and much else in life, most of what makes foreign policy work – or not – is a matter of implementation and execution. This observation will be tested more than once in 2016 and subsequent years. One prominent example is the Trans-Pacific Partnership (TPP), the trade pact signed in October by 12 Pacific Rim countries in Asia and the Americas. If the accord enters into force, it will expand world trade, boost economic growth, and strengthen the United States’ ties with regional allies who would otherwise be tempted to move closer to China. The agreement’s entry into force, though, is subject to ratification by most of the 12 signatories’ legislatures. The outcome in the US and Japan, the world’s largest and third largest economies, respectively, will be particularly consequential. Indeed, everyone is waiting to see what happens in the US. December 30, 2015: Since 2012 the U.S. Army has been looking for cell phones rugged enough and with features that make it suitable for military use in a combat zone. These combat smart phones (CSPs) must also be as flexible and up-to-date as their civilian counterparts. To that end, the army sought CSP designs that are rugged, cheap, and provide critical stuff like encryption via software, not custom hardware. Since even the smart phone hardware is a rapidly moving item, CSPs should cost the army less than $300 each and be built to get replaced every two years or less. This price is about what current cell phones sell (wholesale, to dealers). There would be a similar, but slower, replacement schedule for the battlefield cell towers, routers, and other gear. Not surprisingly, the army is allowing several different families of smart phones and supporting gear to be developed and tested. Fortunately for the army at about the same time the search for CSPs began cell phone manufacturers noted that there was already a civilian market for a similar cell phone. This was the construction and remote facilities (oil fields, mines, lumbering) market, plus the rather large number of people who hike, go camping and climb mountains. There are over a dozen of these ruggedized cell phones out there and that made it easy for the army to find the hardware. Your typical ruggedized cell phone is waterproof, resistant to shock (being dropped) easy to read in the sunlight and has lots of battery life. These models all use the Android OS (operating system), the most widely used OS on the planet. One problem the military is has encountered is the cost of obtaining certain hardware features. The most important of these is the ability to use mesh networks (CSPs automatically setting themselves up as nodes of a network). Mesh networks are discouraged for commercial cell phones because there is no advantage to the cell phone companies. But for the military, all their users are one customer who often operate in areas where there are no cell phone towers. So mesh makes a lot of sense. Fortunately some commercial manufacturers began adding mesh capability to their wi-fi hardware that is now standard on all phones. This came after noting that software that tweaked the wi-fi to enable cell phones to establish a mesh network were popular. So now the mess networking hardware is available in many phones. Before he served as Pentagon chief under President Bill Clinton from 1994 to 1997, Perry played a central role in developing and modernizing nuclear forces throughout the Cold War. Now, he is on a mission to warn of a “real and growing danger” of the very weapons he helped develop. During the 1962 Cuban missile crisis, Perry was secretly summoned to Washington to analyze intelligence on Soviet weapons in Cuba. “Every day that I went to the analysis center I thought would be my last day on earth,” he writes in a newly published memoir, “My Journey at the Nuclear Brink.” He said he believed then and still believes that the world avoided a nuclear holocaust as much by good luck as by good management. In an interview with reporters earlier this month, Perry recounted a harrowing incident in November 1979 when, as a senior Pentagon official, he was awakened by a 3:00 AM phone call from the underground command center responsible for warning of a missile attack. The watch officer told Perry his computers were showing 200 nuclear-armed missiles on their way from the Soviet Union to the United States. Seychelles is expecting India’s evaluation team to visit the spot soon, President Michel said. The project has acquired significance following China acquiring its first African naval base in Djibouti in November. Once ready, the naval base to be built by the defence forces of India, and Seychelles will help India exercise greater control over the Indian Ocean’s western region all the way to the piracy-prone eastern African coastline. The base will be one of the major staging posts for a large maritime security network that India is setting up with the help of the various Indian Ocean region partner countries. Apart from the naval base, India is set to acquire a fully operational coastal radar system (CRS) based in Seychelles from March 2016, Mr. Michel said. The CRS will provide India with the ability to gather intelligence and assist in surveillance operations of the vital energy lanes near Seychelles. “The Maritime Radar Project is a major development for Seychelles’ and India’s mutual desire for security in the field of maritime security,” said President Michel, who was sworn in for a third term on December 20. The NSA-Israel Scandal: Who Cares? Communications between Benjamin Netanyahu and Congress were fair game for the NSA. Adam Entous and Danny Yadron of the Wall Street Journal had Facebook, Twitter and every other social media platform abuzz last night when they published their exclusive December 29 piece, entitled “U.S. Spy Net on Israel Snares Congress.” The account, based on interviews with more than two dozen former and current administration and intelligence officials, outlines the length to which the National Security Agency—under explicit orders from policymakers in the Obama administration—kept tabs on Israeli Prime Minister Benjamin Netanyahu during the high-stakes nuclear negotiations with Iran. “The U.S., pursuing a nuclear arms agreement with Iran at the time, captured communications between Mr. Netanyahu and his aides that inflamed mistrust between the two countries and planted a political minefield at home when Mr. Netanyahu later took his campaign against the deal to Capitol Hill. December 29, 2015: ISIL (al Qaeda in Iraq and the Levant) was recently revealed as a heavy user of unencrypted messaging software (usually smartphone apps) during actual attacks, rather than just for recruiting and fund raising. Major intel agencies knew this, because these organizations have long tracked Islamic terrorist activity on the Internet. Most of the terrorist Internet users are not techies and pay more attention to all the messages they send in receive rather than security (how best to hide them from anyone.) All this came as a surprise to many journalists, politicians and people in general. It had been believed that the Islamic terrorists were using new encryption tools that were all the rage in the geek community. But the vast majority of Islamic terrorists and their supporters are not geeks and the intel agencies were content to keep quiet about this because they knew that saying otherwise would cause panic among Islamic terrorist social media users and make a lot of them more difficult to track. The media coverage of how vulnerable messaging sites like Telegram were did cause panic, especially since a lot of Islamic terrorist supporters were users of Telegram and many were arrested in the wake of the November 13 Paris attacks. Each Telegram user who was arrested usually had enough data on his phone of PC about fellow Islamic terror fans to get them arrested as well. Soon the Islamic terrorist chatter on the Internet was all about how everyone had to be more careful and not share personal information over the Internet. But if the past behavior is any indicator the average Islamic terrorist (or supporter) will soon revert to sloppy (and vulnerable) habits. Islamic terrorists have been early and energetic adopters of social media on the Internet. This has always been a mixed blessing. The terrorists and their fans soon found that the messaging went two ways and those who disagreed with them had no trouble, or inhibitions about responding to terrorist messages. This was particularly the case with Twitter. Here even the U.S. State Department found it effective to assign people to respond to terrorist tweets. The State Department had people who spoke Arabic and other languages Islamic terrorist fanboys used and had the culture awareness to become very annoying for the true-believers. Interrogations of captured terrorists or terrorism suspected revealed that the responses, especially those from a government agency, had an impact. It scared off many potential terrorist recruits and angered true believers, often to the point where they would reveal things they should have kept to themselves. This sort of backtalk because such a problem that terrorist leaders began warning followers to ignore these infidel taunts and insults and to not respond. The Internet being what it is, most pro-terrorist twitter users found themselves unable or unwilling to heed this advice. Just like they tend to ignore useful advice about Internet security. Members of a cyber intelligence team set up a patch panel antenna during an exercise in October. Using an innovative acquisition approach, the Army has awarded two contracts for next-generation prototype kits to support its Cyber Protection Teams. Through what’s known as Other Transaction Authority—which provides cost sharing and shortening the capability-development cycle speeding the transition of prototypes to the government—the service awarded a total of $4.5 million worth of contracts for Deployable Defensive Cyberspace Operations Infrastructure kits. Critical Stack was awarded $3 million and Parsons Corp., in a partnership with Wolf Den Associates, was awarded $1.5 million, the Army said in a release. The Army met with the companies early this month for “kick-off” meetings and the prototypes are expected to be delivered in April 2016. The kits will be used by Army Cyber Command, located at Fort Gordon, Ga., the Cyber Protection Brigade and Cyber Protection Teams to inform specifications prior to fielding decisions and broader procurement, the Army said. The recent contract awards came out of the first Cyber Innovation Challenge, which focuses on involving industry—including non-traditional defense contractors—to deliver prototypes for rapid evaluation using the OTA model. The primary ‘Anonymous’ account behind the hacktivist collective’s “Operation ISIS” is claiming to have stopped a terrorist attack in Italy. They claim that they are also working to stop others. The account then posted another tweet the following day, threatening more attacks against supporters of the group. “We’re digging your graves,” it said. “We have found you, we are in your accounts and phones, the nightmare is about to begin. After the group deleted those tweets, they followed up with tweets confirming that they have stopped an attack. Of course, the group was met with skepticism from all sides but they noted that no one needs to believe them in order for justice to be served. Since the attacks in Paris, Anonymous has made its vision of eviscerating ISIS devastatingly clear. Immediately after the attacks, tens of thousands of social media accounts with links to the terrorist regime were taken offline. But that was only the beginning. Gray Zone conflicts or Shadow Wars will require a new approach to military operational art. Gray Zone conflicts or Shadow Wars are not a formal type war. They are not traditional conflicts or full scale wars between nations or states. Gray Zone conflicts are not new, the El Salvador conflict in the 1980s and the Somalia Wars in the 1990s are examples of past Gray Zone or Shadow Wars supported by minimum US SOF Forces. Gray Zone conflicts are prevalent as ever and are now becoming the new normal with the recent examples as the Russia Shadow War in the Crimea, the growth of ISIL in the Levant, and the Boko-Harim incursion into West Africa. The current US SOF military approach to a Gray Zone conflict is through two approaches. The indirect approach and the direct approach or often called surgical strike operations. The indirect approach entails SOF forces conducting foreign assistance training and advisory operations to the indigenous forces of the conflict. The main effort for the indirect approach is to build partnership capacity of indigenous force that can provide security and stability of the human domain of the Gray Zone. SOF forces are keenly trained in building partnership capacity or advise and assist operations. SOF forces are an economy of force that can provide a surgical strike capability, to protect the indigenous populace from both internal and external enemy threats. The surgical strike effort or direct approach can offset the enemy, until sufficient indigenous forces are available to deny an adversary a decisive advantage on the Gray Zone populace. A small foot print on the ground of SOF teams working by, with and through indigenous proxies in Gray Zone is a viable option to respond and deter Shadow Wars. SOF ground force commanders often face the reality that Gray Zone conflicts have plethora of restrictions, constraints and challenges. Military Service Professional Military Education (PME) institutions currently lack development in military operational design and art of Gray Zone military campaign development. Only SOCOM provides an enlisted PME to its senior NCOs for this type of warfare. The Joint Special Operations University (JSOU) Career Education Program Three (CEP 3) PME addresses operational art, design and campaigning in Gray Zone type conflicts. “Operational art is the thoughtful sequencing of tactical actions to defeat a component of the armed forces of the enemy” (Kelly & Brennen). In Gray Zone conflicts, defeat of the enemy may not be attainable nor is the word “defeat” applicable to the conflict. 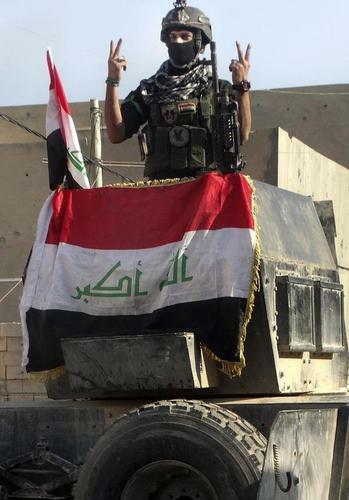 SOF Forces must think in terms of negate, controvert or disaffirm the enemy from the human terrain. The conference will debate and discuss how terrorism and acts of terrorism are understood and explained. There will be inter-disciplinary contributions investigating how states and societies construct understandings and categories of terrorism and extremism. By investigating how understandings of terrorism are constructed it is hoped we can contribute to the development of more effective strategies for countering the extremist ideas that lead to the acts labeled as terrorism. Eighteen international speakers addressed a broad range of topical areas related to the conference focus and engaged in interactive Q&A and discussion with audience members. Speaker backgrounds encompassed the fields of communications, criminology, law, journalism, political science, psychology, public policy, and sociology. In his conference welcome, Dean Melvin Oliver recognized the ‘amazing, diverse set of accomplished scholars’ who had come together to address this topic and emphasized the mutually beneficial nature of the UCSB-TRENDS partnership with their common interest in the role of social policy and a strong commitment to inter-disciplinary study. Dr. Ahmed Al-Hamli, President and Founder of TRENDS, spoke to the fact that conferences such as this one help to develop the needed frameworks for addressing terrorism through providing understanding of both the local context and global environment and suggesting appropriate and coordinated responses. Could Iran Sink a U.S. Navy Aircraft Carrier? The United States is accusing Iran of testing rockets near one of its aircraft carriers in the Persian Gulf as it passed through the Straits of Hormuz. U.S. Central Command (CENTCOM) denounced the Iranian actions as “highly provocative.” But could Iran actually sink one of the U.S. Navy’s mighty flattops? According to CENTCOM, Iranian Revolutionary Guard Corps (IRGC) naval vessels conducted live-fire drills less than 1,500 yards away from the Nimitz-class carrier USS Harry S. Truman (CVN-75), the Arleigh Burke-class destroyer USS Bulkeley (DDG-84) destroyer and the French frigate FS Provence on Saturday. Moreover, civilian shipping traffic was in the area. “Firing weapons so close to passing coalition ships and commercial traffic within an internationally recognized maritime traffic lane is unsafe, unprofessional and inconsistent with international maritime law,” said CENTCOM spokesman Commander Kyle Raines in a statement. He noted, however, that the Iranians were clearly not firing in the direction of the U.S. ships. The Straits of Hormuz are a natural chokepoint for entry into the Persian Gulf. The channel is only about twenty-one miles wide at its narrowest while the shipping lane is about two miles wide. There is also a two-mile buffer zone on either side of the sea lane. The narrow straits are an ideal point for Tehran to make an attempt at blocking access to the Persian Gulf or to ambush allied naval forces—which indeed it attempted during the 1980s.